The region at upper left is the 20-arcminute-diameter southern sky field centred on the rich Eta Carinae Nebula. 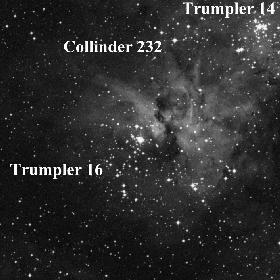 It contains some of the youngest known stars and open clusters, including Eta Carinae itself, an exotic superluminous variable that brightened considerably about a hundred and fifty years ago. All three clusters in the field appear to be only about a million years old, and are roughly 8800 light years distant. At upper right is a spatially adjacent 10-arcminute-diameter field of Carina centred on two Wolf-Rayet stars: WR38, of type WC4, and WR38a, of type WN6. Steve Shorlin, who recently (1998) completed his M.Sc. thesis under my supervision, studied the field as part of his thesis research by means of CCD imaging obtained with the University of Toronto's Helen Sawyer Hogg telescope on Cerro Las Campanas. 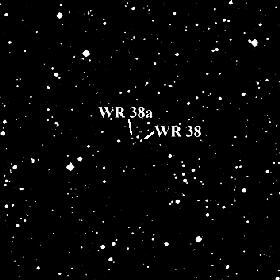 He found a previously undetected cluster of young, luminous, OB stars, 41,000 light years distant, containing the two Wolf-Rayet stars. They appear faintly in the image. It is the first time that both types of Wolf-Rayet stars have been found in the same cluster, which indicates a close similarity in age and luminosity for the two stars. The cluster at upper left is IC 1590, a glorious young cluster embedded in the red glowing hydrogen gas of the H II region NGC 281. The field is about 30 arcminutes across. 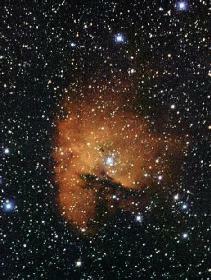 The molecular clouds and hydrogen gas associated with NGC 281 have long been favourite objects of study at radio and infrared wavelengths, but the cluster remained relatively overlooked at optical wavelengths prior to an investigation by Harry Guetter (U.S. Naval Observatory) and me, published in 1997. Shown at upper right is the 15-arcminute-diameter field of the sparse open cluster Berkeley 58. The cluster would likely remain unstudied, were it not for the presence of the 4-day Cepheid CG Cas roughly 5 arcminutes from the cluster centre. 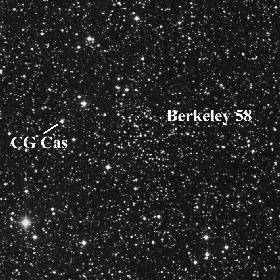 The two appear likely to be associated, in which case a determination of the distance to Berkeley 58 through main-sequence fitting can provide estimates for the luminosity and reddening of CG Cas. Clusters of this type are key calibrators for the Cepheid period-luminosity (PL) relation. Click here for a list of open clusters, multiple systems, and associations that contain Cepheids as potential members.